Hello!! Jennalee here today. Don't you love when you get inspired by the piles that accumulate on your work table? That's how this project came about. I had a couple of the Pocket Watches from the assorted size pack setting out and on top of them, I had thrown a test cut of a witch die cut. When I saw them sitting there together it made me think of the witching hour. Cut background circle for clock from Worn Wallpaper. Stamp spider web using VersaMark and heat emboss with Charred Gold. Heat emboss the clock face using Hammered Metal embossing powder. 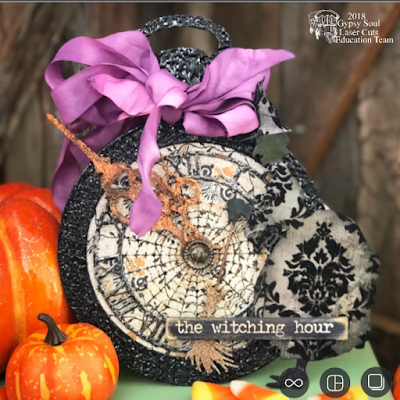 Heat emboss the pocket watch using Rocky Road Baked texture. Two layers of powder gave the perfect textured finish and coverage. Emboss clock hands with Ranger Sticky Embossing Powder. While powder is still hot sprinkle on orange glitter. For the best coverage work in small sections as the Sticky Embossing Powder dries quickly. Once the orange glitter has set distress using Vintage Photo Distress Crayon. Heat emboss brad with Charred Gold. Sand Quote Chip and distress with Distress Inks. Adhere two layers of black cardstock and die cut witch from Tim Holtz's Sizzix Witchcraft die. Die cut another witch out of a flocked piece of patterned paper. From the patterned paper witch cut out the hat and dress and adhere to the black cardstock die cut. Color in face and hands with Peeled Paint Distress Oxide. Heat emboss the broom handle with bronze powder. For the bristles of the broom heat emboss using Dirty Sand Baked Texture. Add detail with blending tool and Black Soot Distress Oxide. Dye seam binding using Seedless Preserves Distress Oxide and Dusty Concord Distress Ink. Tie a fluffy bow around the top of the pocket watch. Attach witch to front of clock using foam squares and adhere Quote Chip on top of witch. Thanks for stopping by and spending a few minutes with me today. I'm looking forward to a weekend of creating and sneaking in some candy corn, it's not just for props! !